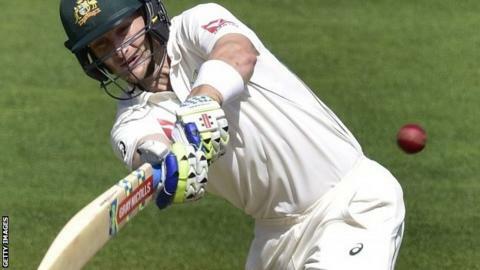 Australia's Adam Voges has been likened to legend Sir Donald Bradman after lifting his average to more than 100 in the first Test against New Zealand. Voges, 36, ended day two in Wellington on 176 not out to move ahead of Bradman, whose career average of 99.94 from 52 Tests is the best of all time. Voges' average is 100.33, although that would drop to 92.4 if he did not score any more runs in his 19th Test innings. Usman Khawaja hit 140 as Australia closed day two on 463-6, a lead of 280. The pair put on 168 runs for the fourth wicket and Khawaja, who has scored four centuries in his last six Test innings, said he may start calling his batting partner "Sir Voges" in a nod to Bradman who is considered to be Test cricket's greatest ever batsman. Voges has scored three successive centuries, adding to the 269 not out and an unbeaten 106 against West Indies in December to take him past India legend Sachin Tendulkar's record of most Test runs between dismissals, which stood at 497. He has extended that to 551 runs but he should have been out for seven in the final over of Friday's first day at the Basin Reserve when he was bowled by Doug Bracewell - but English umpire Richard Illingworth called a no-ball, when television replays showed it was a legitimate delivery. Khawaja described Voges' innings as "almost faultless", adding: "He's batted very sensibly, patiently at the start. He was hitting a lot of good shots straight to fielders but didn't get frustrated with it. "The way he's been batting lately it feels like he's not going to get out sometimes, and he's making big hundreds which is important for the team." Voges, who will play for Middlesex again this summer, became the oldest player to score a Test century on debut, at the age of 35 against the West Indies eight months ago, and has now compiled five. If he is dismissed in this Test innings, he will need to have scored 272, eclipsing his current highest score of 269 not out, to keep his average above 100. Bradman famously needed just four runs in his final Test innings to finish his career with an average of 100 but was bowled for a second-ball duck by England's Eric Hollies at The Oval in 1948. The only man to have a Test career average higher than Bradman - technically speaking - was West Indies opener Andy Ganteaume, who scored 112 against England in his only Test innings in 1948, and was never picked again. However, cricket average lists normally require a minimum number of innings to have been played.